These are truly admirable performances. Ensemble is alert, accurate, never forced: already a favourite CD. 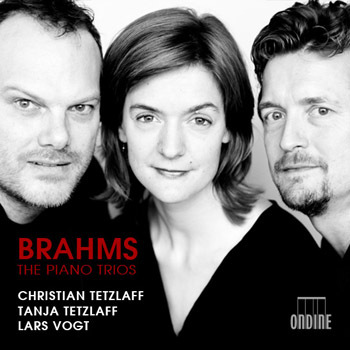 Award-winning violinist Christian Tetzlaff and pianist Lars Vogt are joined together with Tanja Tetzlaff in this exciting new recording of the Johannes Brahms (1833-1897) Piano Trios. The Brahms Piano Trios belong to the very core of the romantic chamber music repertoire. They span a period from the 1850s (the 1st version of Op. 8) to the 1880s, Op. 101 being completed during the last decade of Brahms' active career as a composer. Piano Trio No. 1 was also revised by the composer as late as in 1889. Christian Tetzlaff has been considered as one of the world's leading international violinists for many years, and still maintains a most extensive performing schedule. Musical America named him "Instrumentalist of the Year" in 2005 and his recording of the violin concertos by Mendelssohn and Schumann, released on Ondine in 2011 (ODE 1195-2), received the "Preis der deutschen Schallplattenkritik". Gramophone Magazine chose his recording of the Schumann Violin Sonatas with Lars Vogt (ODE 1205-2) as "Disc of the Month" in January 2014. In addition, in 2015 ICMA awarded Christian Tetzlaff as the "Artist of the Year". Chamber music plays a significant part in Tanja Tetzlaff's career. She gives regular recitals in renowned concert series and festivals. In addition to successes in many international competitions, she has collaborated with world-renowed orchestras and conductors. Lars Vogt was appointed the first ever "Pianist in Residence" by the Berlin Philharmonic in 2003/04 and enjoys a high profile as a soloist and chamber musician.